Mariah Bryant woke up at her boyfriend’s house on Sunday feeling a few contractions but not worried since her baby wasn’t due for another month. To be on the safe side she decided to go to the hospital and asked boyfriend Jesse to stay with her 4-year-old son. Jesse agreed. He’d already had a busy morning shoveling Mariah’s car out from under the mountain of snow the recent snowstorm had dumped on Kutztown. Mariah asked her friend April Wilson to come along on the ride to the hospital. As she left, her contractions were a manageable 15-20 minutes apart and causing no pain. By the time she picked up April and was heading west on Route 22, that had changed. Her contractions were increasing in frequency, and rapidly…suddenly four, then three, then two, then only a single minute apart. The pains were worse, but Mariah stayed calm and knew what to do when she felt the baby’s head. One push and the head was free. Another push delivered the rest of the body, and a third brought the placenta. Mariah had delivered her 4 pound 8 ounce baby herself. Doctors at the hospital were impressed that Mariah remained so calm. She and little Brantly Jory Mackaravitz – an early but healthy baby – were taken by ambulance to Lehigh Valley Hospital where both were reported to be doing well. 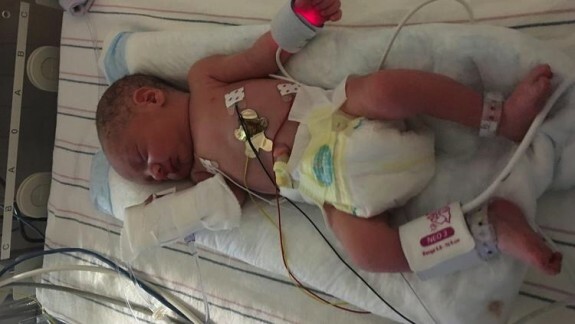 Per standard procedure for babies born before 35 weeks, Brantly is staying for a few days in the Intensive Care Unit.